So what you're saying is, these anatomical observations are a poor guide to deep ancestry? I am merely relaying the fact that despite the smoke and mirror games that some like to play with genetics these are people (early Eurasians) who look no different than the range of modern day "Sub Saharan African" types. Much evidence suggest that it remained this way until around the second millennium BC. "Furthermore bi-iliac breadth appears to change slowly over time, likely due to multiple factors (thermoregulation, obstetrics, locomotion) influencing its shape (Ruff 1994; Auerback 2007).."
"Generally narrower body breaths of the foragers contrast markedy with the wider-bodied agriculturalists. Although bi-iliac breadth has been argued to be stable over long periods of time (Auerbach, 2007), this shift in mean body breath may be indicative of changes correlated with subsistence economy." "Any use of the bi-iliac breath/stature body mass estimations would inherently reflect changes in stature.."
You do realize aside from the Ancient Egyptians the data is from Ruff 1994 don't you? She's just literally copy/pasting Ruff's data and table into her paper. And obviously blaming it on agriculture alone does not cut it....since it's so heavily correlated to latitude. Two agricultural populations of different latitude/climate don't have the same bi-iliac breaths or even close. Anyway, the Cranio-metric data totally debunks you and that's much more important. If you were hoping to persuade anyone with skeletal evidence from where we don't have ancient DNA, discrediting it where we do is not the best tactic. And obviously blaming it on agriculture alone does not cut it....since it's so heavily correlated to latitude. "While not attempting to underestimate the contribution that Deltaic political and religious institutions made to those of a united Egypt, many Egyptologists now discount the idea that a united prehistoric kingdom of Lower Egypt ever existed." "Maadi and both northern Early Dynastic series, while distinctive, are closer to the Upper Egyptians on PC 2 in “shape” than Wadi Digla, which indicates a level of diversity in Lower Egypt. Interestingly, the Maadi PD sample is more similar overall to Upper Egyptians than to Lower Egyptians (with the exception of Wadi Digla) when compared to Badari. The Abydos ED series, as noted, shows similarity to the Predynastic Upper Egyptian series, but is also distinctive along both axes of variation. On PC 1 and 2 the Predynastic Upper Egyptian series (Abydos, Naqada, Badari) group more closely to each other overall than do the Lower Egyptian Predynastic series (Wadi Digla and Maadi), depicting the greater level of diversity in northern Egypt." ------Keita, SOY, Godde, K. 2016. A preliminary analysis of diachronic craniometric geographical variation during the Predynastic-Early Dynastic period: possible population implications for the theories of the merger of upper and lower Egypt. Göttinger Miszellen 249: 97-110. Last edited by Asante; 02-11-2019 at 04:26 AM. Do you understand that these measurements don't change? The later designation of a haplogroup to ancient and analyzed skeleton does not make a person with external anatomical features related to black Africans, suddenly change to look like white people. Do you understand? That would be like digging in Cameroon, and finding a Negroid skeleton, and saying that because he belongs to Y-DNA hap R that he is no longer physically a black man. You all have no logic, but just as I suspected is an attempt to rewrite your history in fantasy. We don't have any ancient DNA from the Grimaldi skeletons (do we?). It seems highly unlikely that they would somehow turn out to be West Africans, but who knows, maybe they are different from other ancient Europeans. If you have some theory about how they have separate origins from other ancient Europeans, good for you. 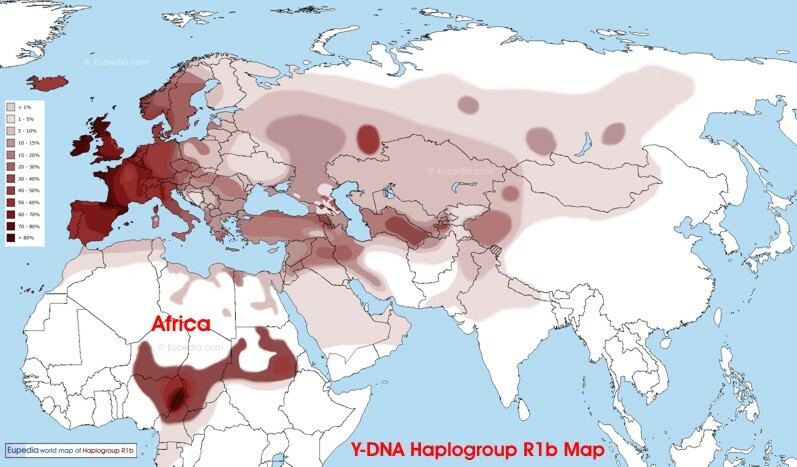 We do have ancient DNA from hundreds of other ancient Europeans, and most of it is genome wide, not just uniparental haplogroups. Why not dig up the physical anthropology for those ones, so we can have a useful discussion? Last edited by Megalophias; 02-10-2019 at 06:51 PM. There is no getting away from that fact. Bottom line is you are horribly under-researched or intentionally spreading misinformation if you ever thought Grimaldi was the 'first European'. To your first blurb, so what? They hadn't fully adapted to their new environment yet. This about ancient Egypt, why are we even talking about 'Cro-magnons'? To your second blurb, genetics has since overturned your now outdated reference. Last edited by Kale; 02-10-2019 at 08:52 PM. It's quite obvious that the authors of the study in question equated SSA and Africa as a whole with a single proxy--modern Yoruba. The same thing is true of Lazaridis et al. and their first study on the Natufians, so it's not a pointless tangent. Well, I don't believe the Abusir mummy authors really think that. I agree that more African proxies in the qpAdm and f4 ratio would be nice, but it's not like those are the only analyses. You are mistaken about the Natufians - Laziridis et al compared them with Mota, Mbuti, and Ju|hoan North in addition to Yoruba, which is a pretty good set. I am not sure if there are any modern studies on that question. Most of the studies available compared Ancient Egyptians with contemporary ancient Nubians and sometimes modern day African Americans and SSAs. However, as far as I am aware, modern day Nubians are seen as descendants of the medieval Christan kingdom of Nubia and are not seen as being directly descended from the Nubians (A-group Nubians, Kushites, Medjay, etc.) associated with Ancient Egypt. Thanks. I did some Googling I found a couple of studies that claim continuity between Meroitic and Christian Nubia, but I haven't found anything about modern Nubians. Another one says that there was some migration from the north during that period also. That was taken from: ''The questionable contribution of the Neolithic and the Bronze Age to European craniofacial form'' Brace 2005. The first problem is that 2005 is a millenia away in a field that is changing so quickly. The skeletal analysis and reconstructions performed on European Neolithic and pre-Neolithic remains since then have shown that even WHG resembled modern Europeans craniofacially. Not to mention EEFs who have WHG admixture. The second problem is your quote: 'the Neolithic peoples of Europe and their Bronze Age successors are not closely related to the modern inhabitants'. As I already said, and to repeat what Kale said, since 2005 we have had hundreds of autosomal results from WHG,EEF, not to mention Bronze Age Europeans and they all cluster with modern day Europeans on a world scale. Being subjective for a second, I'd go as far as to say that were we to meet a farmer from the European Neolithic today, their appearance would probably resemble something like Mediterranean-Balkan.